On Saturday 28th November protests took place in Brighton, Wrexham, Falmouth, Hastings, Tunbridge Wells and Cambridge [Pics] as part of a day of action marking the launch of Smash EDO’s‘Target Barclays’ campaign.On November 30th an action took place in Plymouth. Smash EDO’s next big mobilisation is the REMEMBER GAZA SMASH EDO MASS DEMO JANUARY 18TH. Assemble at 1pm, Brighton, wear black. In Wrexham a picket was held outside the new local branch of Barclays and in Cambridge on the night of the 27th November a group of anonymous pixies scaled scaffolding above a Barclays branch and carved the words “Barclays – £7bn in the Arms Trade” in six foot letters(more pics) into tarpaulins. The message was still visible on the evening of the 28th. Pickets were also held outside Barclays Falmouth and Tunbridge Wells branches, while Barclays in Hastings was leafleted. 2009 has seen an increase in actions against investors in the arms trade. Smash EDO’s Mayday! Mayday! street party saw actions against Barclays, Mcdonalds, RBS and HSBC (all investors in ITT). This summer saw more actions at branches of RBS and HSBC against their arms trade investments.During this year’s Camp for Climate Action a mass action was held against Barclays, highlighting the link between Barclays dirty investments in coal and its arms trade investments. During the Disarm DSEi mobilisation a map was produced of arms trade investors in the city and, during the mass action, Barclays, RBS, Aviva, AXA, Legal and General and HSBC were targeted. On Saturday 28th November actions took place in Brighton, Wrexham, Falmouth and Cambridge to mark the campaign launch. A large demonstration was held in Brighton, thousands of leaflets were handed out, two Barclays Customers, after reading the leaflet, agreed to close their accounts and a letter was handed in to the branch manager. The branch was guarded by a heavy police presence and private security, drafted in for the day, from the “Professional Witness Service”. 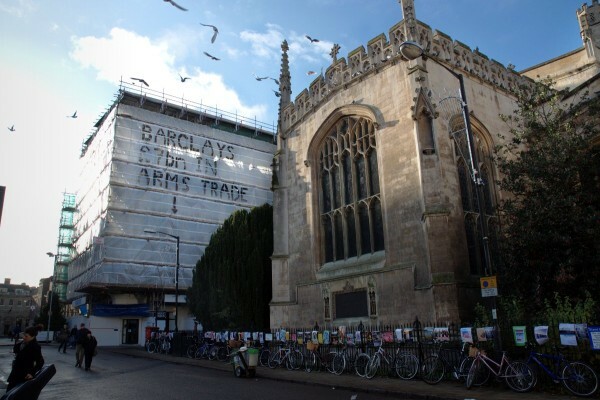 In Cambridge anonymous campaigners scaled scaffolding above a Barclays branch and carved ‘Barclays – £7bn invested in arms’ in 6 foot letters in tarpaulin. The message was still there the following day. Hastings against the War also braved torrential rain to let their branch know that the campaign had begun by leafleting outside their local branch. In Falmouth campaigners from Kernow Action Now (KAN) demonstrated outside their local Barclays. In Wrexham the new branch of Barclays was picketed. Police also stood guard outside the Falmouth and Truro branches of Barclays. Smash EDO are calling for groups to take autonomous actions against Barclays until Barclays cease providing market Maker services to ITT.